Our pets live with us in what is for them a potentially risky environment. It is essential for their safety, perhaps even their lives, that owners have a clear understanding of poisonous foods and substances for dogs. They are exposed to much in living with us that their bodies and nervous systems were never designed to tolerate. Too many dog owners have learned a painful lesson that a human home can be a dangerous place for a pet. To help yourself protect your dog's health and make his home a safe place, become familiar with this list of toxins that can harm your pet. If you suspect your dog has ingested any of these and is showing signs of distress, see your vet and be sure they understand what he has eaten. All information has been verified by the RSPCA. Avocados contain persin in the fruit, and all parts of the plant. Can cause diarrhoea, vomiting, breathing problems, cardiovascular problems, fluid in the abdomen and around the heart. Peach, plum, persimmon and apricot pits, and apple and cherry seeds - They contain a cyanide compound. Can cause hyperventilation, dilated pupils and even lead to shock. Grapes and raisins, or foods containing them - The specific toxin is not yet identified, nor how much must be eaten before harm is done. Can cause kidney failure. 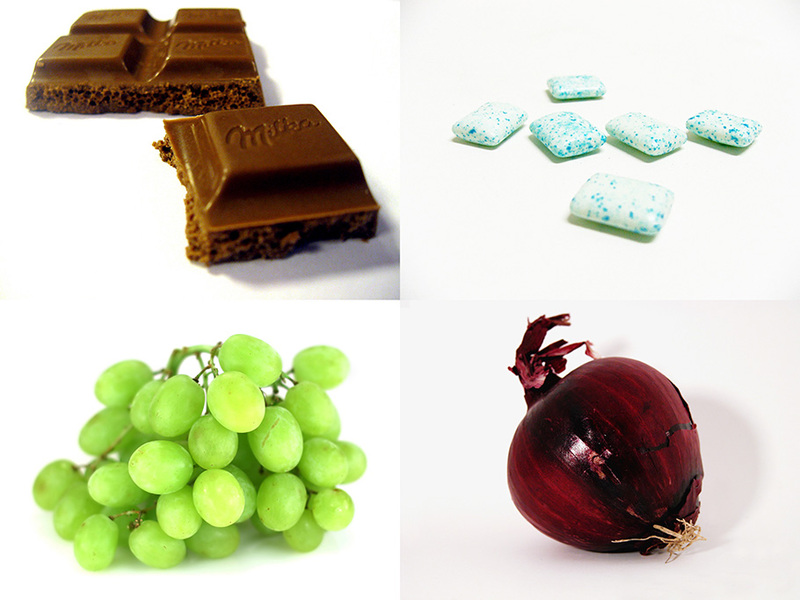 Chocolate - Contains theobromine, the darker, the higher the content. Can cause tender abdomen, vomiting, drooling and excitability, excessive thirst, convulsions and slow heart rate. Sugar - Leads to obesity, diabetes, and dental problems. Alcohol Sharing a beer or a drink with your furry friend can be dangerous. Alcohol has the same effect on them as on the human brain, nervous system and liver. Can cause disorientation and loss of coordination, vomiting, diarrhoea, and coma. The smaller the dog the worse the effect. Has resulted in death. Coffee, or caffeine - In large enough doses it can be fatal. It has no antidote. Can cause heart palpitations, bleeding and tremors. Watch out for hidden caffeine in chocolate, energy drinks, colas, and cold and pain medicines. Milk and milk products - Can cause digestive upset, diarrhoea, and allergy reactions. Excess fat trimmed from meat - Can lead to pancreatitis. Raw eggs - Contain a substance that interferes with absorption of a B vitamin when consumed in quantity, or over time, plus, may be contaminated with salmonella or E.coli. Raw fish - Can have a parasite that causes "fish disease," which if untreated can be fatal in two weeks. Signs are fever, vomiting and swollen lymph nodes. Raw yeast dough - Live yeast activity leads to painful abdominal swelling and also produces alcohol. Salt - Leads to excessive thirst, sodium ion poisoning and too much urination. Salt poisoning symptoms are depression, high temperature, diarrhoea, vomiting, tremors, and seizures. Macadamia nuts or anything containing them - Potentially fatal! Even six, either roasted or raw, can make your pooch very sick. Poisoning symptoms are paralysis of the hindquarters, tremors, rapid heartbeat, and high temperature. The combination of macadamias with chocolate is more serious, and can cause death. Onions and garlic - Any form, cooked, raw, dried or powdered leads to anemia by destroying red blood cells. Small amounts now and then are okay, but one binge, or ingesting a little bit regularly can be dangerous. Most chemicals around the home are obviously toxic, such as bleach, rodent poison and insecticides. But those listed below are worth noting because they are so common around the home they are easy to forget. Potpourri - Some has been reported to contain strychnine. Ingestion of strychnine is very dangerous. Symptoms include muscle and legs going rigid, severe spasms, high temperature, vomiting, and the inability to breathe. Take your dog to the emergency vet immediately. Candy and Gum - Sugar, as already noted, is unhealthy for your dog. But the main problem with candy and gum is the sweetener xylitol. It can raise the amount of insulin present in your dog's body, and just like with humans, cause a dramatic drop in blood sugar. And it can lead to liver failure. Symptoms are loss of coordination, lethargy and vomiting, and in time, seizures. Within a few days, liver failure can begin. Human medicines - Reactions to human medicines are the number one cause of dog poisoning. Ibuprofen and acetaminophen can be fatal. Keep all medicines out of their reach. Never, ever give your dog any over-the-counter medication without checking first with your vet. Antifreeze - Fatal! Keep it out of reach. It is easy to get lax and forget to clean up spills. It has a sweet taste and dogs will lap it up. Symptoms of poisoning are staggering, fatigue, rapid heart rate, dehydration, and continuous vomiting. Take your dog to the emergency vet immediately! If you wait, even with intensive treatment, recovery is poor. Human toothpaste contains fluoride and often xylitol. Fluoride is toxic to dogs and can lead to stomach upset. Also our toothpaste foams too much for them and they will swallow it, again adding to stomach upset. Purchase xylitol and fluoride free dog toothpaste from your vet. Poisonous plants - Though they are beautiful, it is safest to just not keep plants in your home which are toxic to dogs. Then you never put your precious pet at risk. Here is a list of 15 of the most common house plants which are dangerous. With a knowledge of poisonous foods and substances for dogs, you can keep your pet's living environment healthy and safe. Then you will never have face the heartache of seeing your beloved companion fall ill due to human error.